The traditional red pizza from Vince's Pizzeria in Northeast Philadelphia. 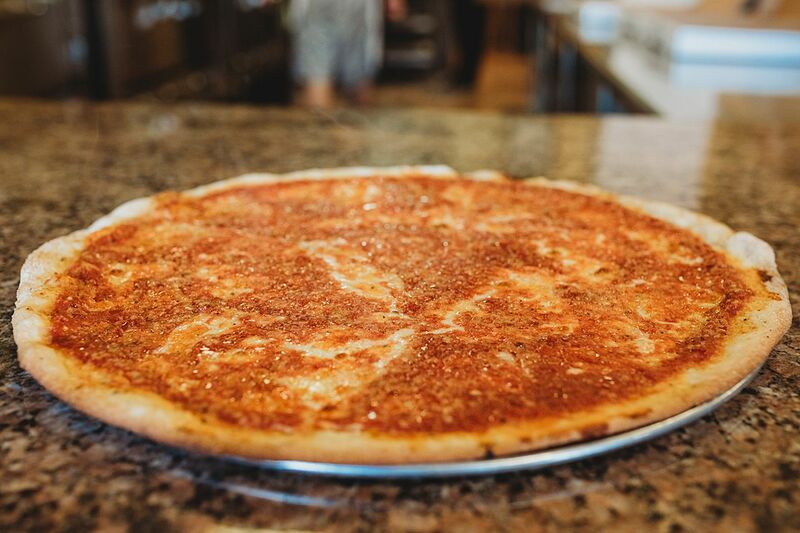 Vince’s Pizzeria, pretty much an institution on Grant Avenue in Northeast Philadelphia, has not one but two offshoots in the works for Bucks County, each to be operated by members of the extended family. Vince Rota, a grandson of the founders, is behind a location due to open in late spring at 2500 State Rd. in Bensalem, part of an enormous mixed-use complex that will include Broken Goblet Brewing. Rota says he will offer a few sandwiches as part of his menu. May is the target for a separately owned Vince’s coming to Newtown. Ed Murray, whose parents, Ed and Mary Ann Murray, operate the original, is working with his wife, Heather, on the new location, which will occupy the former Ariana’s Little Italy at 573 Durham Rd. (Route 413), near Owowcow Creamery’s shop in Wrightstown. This location will have a self-service, 20-tap beer wall stocked with 15 beers, 4 wines, and a cider. Patrons obtain a card, load up its value, and swipe it to get their beer. There are only a few of these systems in the region, including Bru in Center City Philadelphia. Just like the Northeast location, the Newtown menu will include only pizzas (as well as stromboli versions) and a few salads. Among the varieties are the classic red, which starts with sliced mozzarella topped with sauce; the funghi, which is topped with assorted mushrooms, shredded mozzarella and gorgonzola cheese, and white truffle oil; and the PAG, a thin-crust white pizza with slices of pear, shredded mozzarella, gorgonzola crumbles, arugula, and white truffle oil. Vince’s traces its lineage to 1946, when Charlie and Mary Yacovetti started selling pizza on cardboard wrapped in brown paper out of their rowhouse near Temple University Hospital. After Charlie’s retirement in 1959, his children and spouses Viola (Vince Rota), Angelo Yacovetti (Margaret), Lucy (Bill Rieger) opened Charlie’s Pizzeria at 4300 Roosevelt Blvd., which is still operating. In 1988, the Rota children opened Vince’s Pizzeria on Grant Avenue just east of the Boulevard. This article has been updated to reflect the new location in Bensalem.